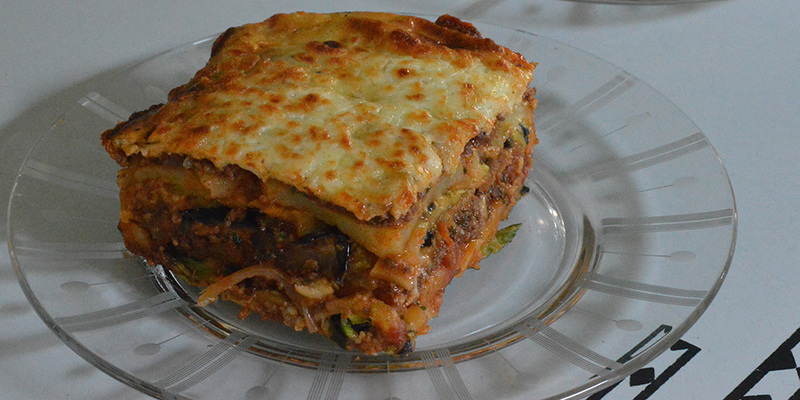 We love moussaka, but it’s a bit of a pain in the arse to make. It’s not terribly difficult, just time consuming. The cooking time is about an hour and prep is at least that long. It’s worth it though, especially since we almost always make one for now and one to stash in the freezer. A month or so later we pull the extra one out on a busy day and enjoy it without any work involved. The vegetarian version at allrecipes has been our go to for a long while, because the (more or less) Béchamel sauce is lighter than anything else we’ve found. This time around we had some bison we wanted to include. We looked at a few recipes and decided Bobby Flay’s sounded promising. Our mash-up of the two recipes, below, makes enough for 2 small moussakas; we doubled everything but the meat and made 2 large ones! We love this stuff. 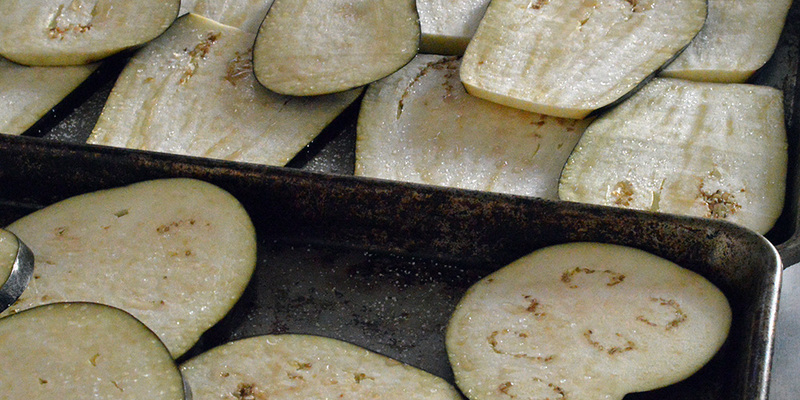 Slice the eggplant into moderately thin slices, sprinkle with salt, and let them sit for at least a half hour. Since we were doubling the batch we tried one lengthwise and one width-wise just to see if there was any difference. There isn’t a big one, but we found the lengthwise cuts lay out better during assembly. Slice the zucchini into moderately thin slices lengthwise. peel and slice the potatoes as well. It’s helpful to slice everything roughly the same width. Thin enough so they’ll function like lasagna noodles, but thick enough so they won’t fall apart. After the eggplant has had a good sweat rinse off the salt and pat the slices good and dry. Give all the vegetables a toss or brush with olive oil, then roast for about 20 mins in a 375 degree oven (on non-stick foil or a lightly-oiled pan), turning them halfway through, until they’re just barely starting to brown. You can go raw with the zucchini if you like, we just prefer to get them nice and limber before they get layered in. They’ll roast faster then the eggplant and tots, so keep a watchful eye and tray them up on their own. Heat a tablespoon or so of your olive oil and brown the bison. Bobby Flay has you add the spices at this point, and we followed his lead, but in the future we’ll wait on this step. He also has you drain the meat after you brown it and discard the liquid/grease (great tip for beef, but we found this pretty unnecessary for our lean bison, plus you lose some of the spices if they’re added before this step). The whole thing is going to simmer plenty, so there’s no need to hit it with spices until you know you’re keeping them all. Bobby is free to explain himself if he likes. Hold on…Bobby just said he doesn’t have to explain himself to the likes of us. While your meat is set aside and draining, add some more olive oil to your pan at a medium-high heat and when it’s hot throw in a halved and thinly sliced onion. Cook until soft then add the garlic (yes, all the garlic). Give the garlic a minute or two to sizzle and then add your spices: cinnamon, ginger, allspice, cayenne, salt, pepper, Aleppo. When those are good and fragrant return your drained meat to the party with your cup of red wine. Stir a few times and let the wine cook off (five or so minutes). 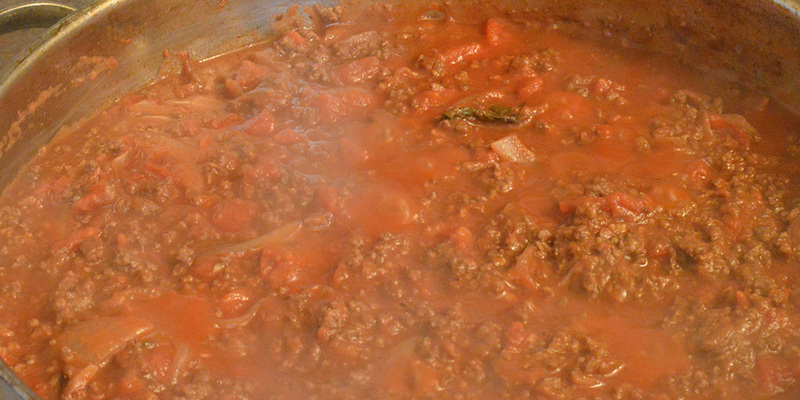 Add your can of crushed tomatoes and stir well, bring to a quick boil on high heat and then reduce to a simmer. Give it a couple stirs over the next half hour, but mostly just let it thicken and co-mingle. When it’s as nice and dense as a good Bolognese remove from the heat and stir in your fresh parsley and oregano. 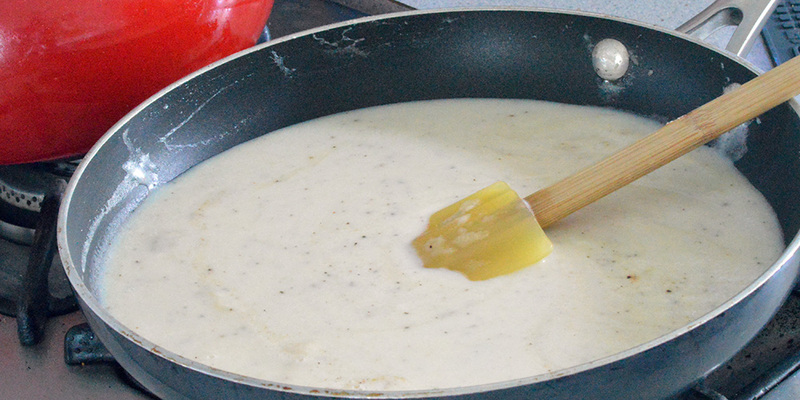 In a saucepan melt your butter, then stir in the flour, and lastly the milk. Bring it to a slow boil stirring constantly until it’s as thick and smooth as ice cream you accidentally left out on the counter last night. Remove from the heat, stir in your nutmeg, along with a little salt and pepper. After about five minutes of cooling stir in your beaten egg. Use either a large casserole dish (9 x 13), or a couple of 8 x 8’s if you want to be like us and freeze one for later. Start with your roasted veggies. You can do a layer of one or a mix-up of all three. Go crazy, it’s your moussaka. 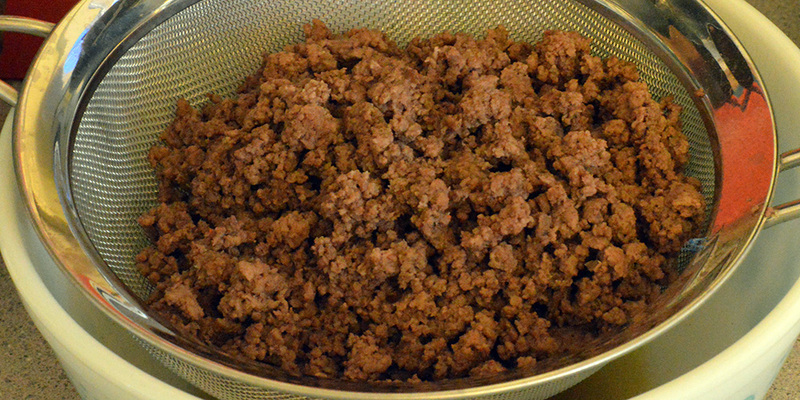 Cover that with a good layer of your meat mixture. repeat steps 1 through 3 until you get just over three quarters of the way to the top of your dish. Pour your sauce over the top. Poke a few holes here and there so the sauce will run through, otherwise that yummy mixture just sort of sits on top like cake frosting. That’s fine too of course. Who doesn’t like cake frosting? Bake on the lower rack for 35 minutes (375 degrees), remove and sprinkle the last little bit of your feta etc, return to the oven until nice and brown on top. Let it cool for a few minutes, then slice that puppy up. Enjoy! This recipe contains anchovies. With that, I’m sure I’ve lost half my audience. I’ll keep going for the other three who either like anchovies or have come to learn that like them or not, they can lend the most intriguing umami flavor to all sorts of recipes. Three in San Mateo makes the Halle Berry, a truly dynamite blueberry jalapeño cocktail: sweet, spicy, with the weight and satisfaction of the best margaritas.